View, edit, and delete keyspaces. Adding a keyspace in OpsCenter is no longer supported. 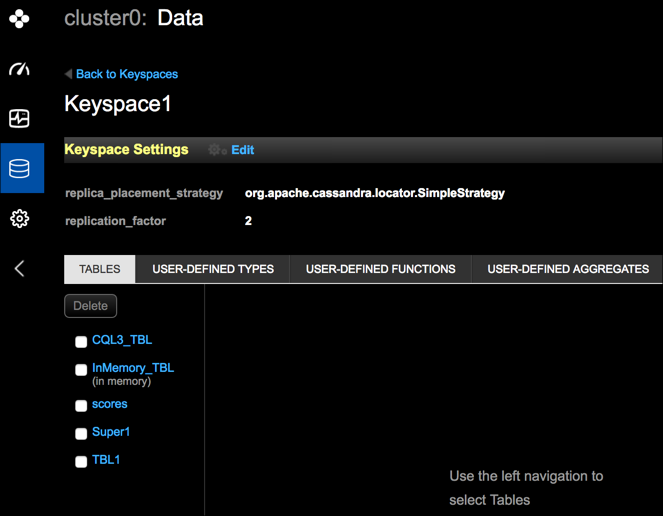 Add new keyspaces in DataStax Studio instead. View the CQL for UDT, UDF, and UDA. Edit keyspace settings or delete a keyspace. Adding a keyspace in OpsCenter is no longer supported. Add new keyspaces using CQL instead. 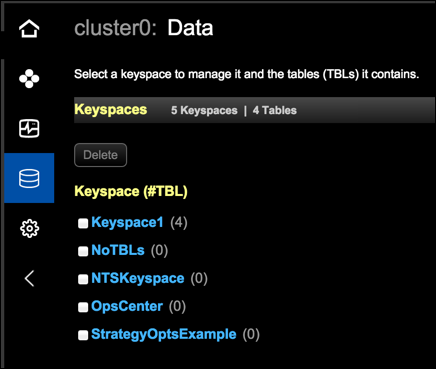 View the CQL for User-Defined Types (UDT) within a keyspace in OpsCenter Monitoring. View the CQL for User-Defined Functions (UDF) within a keyspace in OpsCenter Monitoring. View the CQL for User-Defined Aggregates (UDA) within a keyspace in OpsCenter Monitoring. When you create a table (formerly referred to as a column family) in Cassandra using an application, the CLI, or CQL 2 or earlier, the table appears in OpsCenter. The Data Explorer feature in OpsCenter has been removed and deprecated in favor of DataStax Studio, a visual CQL tool. Edit keyspace settings or delete a keyspace. Adding a keyspace in OpsCenter is no longer supported. Add new keyspaces using CQL instead. See Creating a keyspace. Click Data in the left navigation pane. The list of Keyspaces appears. Select a keyspace from the list of keyspaces. In Keyspace Settings, the replica placement strategy options for the keyspace appear. To edit keyspace settings, click Edit. The Edit Keyspace keyspace name dialog appears. Important: When defining NetworkTopologyStrategy parameters, CQL allows datacenters that are not currently present in a cluster topology. 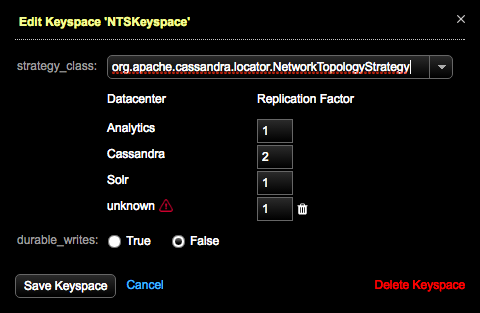 If any datacenter is not part of the monitored cluster, a warning icon and tooltip are displayed. Remove any extraneous datacenters from the keyspace by clicking its delete (trash) icon. To prevent replication of a keyspace to a datacenter, enter 0 (zero) for its Replication Factor. For more information, see Changing the replication strategy for the OpsCenter keyspace. To delete a keyspace, select the keyspace and click Delete Keyspace. A warning dialog prompts you to confirm deleting the keyspace. To view table properties, select the keyspace, and select a table from the pane in the Tables tab. For more information, see Managing tables.